Why losing in the cable all efforts and money spent for your antenna and RTX setup? Why losing your station efficiency for a few saved cents? 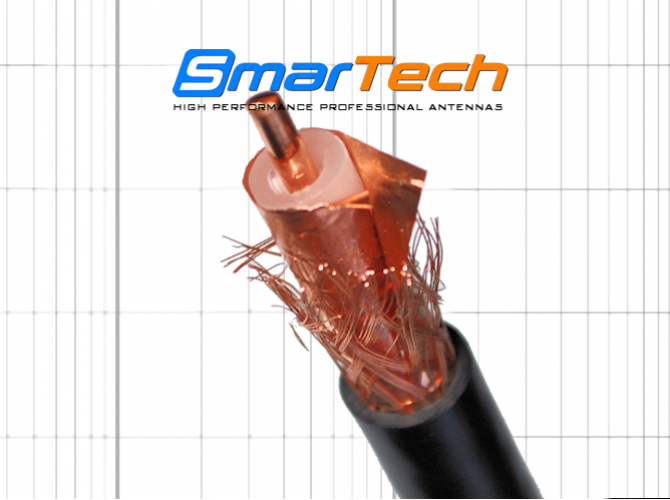 SmarTech selected cables are the result of a meticulous choice and severe tested models, suggested to reach the best performance of our antennas. Our selection criteria consider the lower attenuation, the higher efficiency of shielding for low noise and low EMC (interference to other devices), the best mechanical characteristics. The RH100 is a very low loss double shielded coaxial cable with 50 ohm of characteristic impedance. Its high efficiency of shielding ( >75 dB at 100-900 MHz) gives excellent low noise characteristic due to the strong attenuation of external noises by the shield film+braid. The internal central wire of the RH 100 is wrapped by a special spiral polyethilene element that minimizes the contact between dielectric and conductor. So that global dielectric characteristics are very close to the "air" ones: the very best. External diameter and internal geometry sizes (similar to the RG-213 type) are compatible with all the common connectors such as PL and N-type. Moreover the PVC2 sheath material is enough hard to be free from crushing damages and UV resistant. Best-in-class materials and high quality geometry design make this cable a smart choice for those who are looking for a professional cable for every high performing radio set-up. * The power rating shown in the tables refers to a continue non-modulated signal. A Fistful of CentsWhy losing in the cable all efforts and money spent for your a..
Metallic protective cap with standard thread for SO-239 / N-type / MIC connecto..